(CNS): The deputy premier’s ministry is inviting bids for the next phase of the Cayman Brac Emergency Facility on the Bluff. With an additional $1 million in the budget this year, this bid is for construction of the shell works only, with a footprint of approximately 11,374 square feet, and is scheduled to commence in November 2011, according to the tender. At the groundbreaking ceremony in December, DP Juliana O’Connor-Connolly roundly berated critics of the project, especially the media and “the bloggers”, for not understanding her vision for the future. Nevertheless, her fellow Sister Islands MLA Moses Kirkconnell has said that the money being spent on the emergency shelter would have been better invested in a new high school for the island. According to the plans submitted to the planning department, the first storey of the main building will include the main hall, plus a sick bay, reception area, kitchen and several bathrooms. The second floor will include the command centre, office and conference room. The plans also call for four 2-storey “wings” to the building, each wing with 10 private rooms on each floor, each room with a semi-private bathroom (one for every two rooms). Deputy Premier Juliana O’Connor Connolly, who is also Minister for District Administration, Works, Lands & Agriculture, has previously told CNS that the rooms will have individual temperature control because, she said, during Hurricane Paloma some people were too hot and some were too cold and there was no privacy for the elderly or disabled. 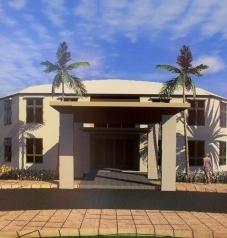 The main hall will accommodate up to 400 people in a storm and each wing will house an additional 100 adults, so the new building adds another 800 shelter spaces to Cayman Brac. When there is an emergency, the private rooms will be allocated on a ‘first come, first serve’ basis, though the deputy premier has said that if a major hurricane was approaching they could allocate one wing for hospital patients. Island Builders was awarded the contract to build the foundation for the main hall of the shelter and the cistern, dubbed the Hurricane Hilton, for $285,000. Work started at the site off Major Donald Drive, just next to the playing field, shortly after the groundbreaking ceremony, at which O'Connor-Connolly said that a lot of vision and foresight had been put into the shelter for the present and future needs of the Cayman Brac. “When one studies history, one finds that great buildings were rarely appreciated until the person who had the vision had passed on and you read about it in the obituary,” she said, adding that it did not matter if there were praises in her obituary, only that she had done as much as she could for her constituents. The government budgeted $1 million for the project in this year’s budget, $900,000 in last year’s budget and $500,000 in the 2009/2010 budget. MLA Kirkconnell has said that the site of 'Hurricane Hilton' would have the ideal location for a new high school campus as it is located right next to the Bluff football field and that the current campus in Stake Bay could have been turned into a vocational school or a hotel training school, which could have attracted students from Grand Cayman. “I believe that money could have been spent more wisely,” said Kirkconnell. This new emergency shelter will be the fourth on the island. The Aston Rutty Civic Centre on the Bluff can hold approximately 500 people, while the West End Primary School, which has been structurally upgraded since Paloma, can hold 250, and the Brac Day Care Centre, located next to the civic centre, can hold 155. The District Administration Building, while not an official emergency centre, also shelters DA staff and their families, and the rebuilt Veteran’s and Seaman’s Centre is an unofficial shelter. In addition, many new homes are being built on the Bluff, where people remain during a storm, and two new churches on the Bluff that were built to hurricane standards have been recently completed. The media and the "bloggers", the people of Cayman have every right to question how their money is expended by the politicians who are paid by the people. This is especially true when a "vision" lacks common sense. Look at the last 20 years. Add up the peoples money that has been thrown away on useless projects, give away drive ways etc., useless security, tinted window SUV's, The Turtle Farm, CAL, lawsuits due to bad decisions, first class living, Churches, nation building, slush funds, fees for cancelled agreements and bloated salaries with bloated pre retirement pension payments. Add all that up and we have no financial problems and don't needs to borrow our grand children's money. Some elected politicians lack a vision for the people and the country. There is no point what so ever in anyone bidding for this project as it is a MATERIAL and labour quote that is required. All of us in the Brac know that the company that got the first contract to do the foundation can get the MATERIAL cheaper than anyone else because of his connections with the aggregate company in the Brac. NO ONE can get the prices that he gets so no one can compete with the materials prices to do the project. What the government needs to do is to negotiate the materials price from this company and provide the materials and then just take a bid for labour – that is the only way that this is going to work fairly. ALSO please advise why the plans to bid on this project are only available in Grand Cayman on a disc and not availabe in Cayman Brac. The disc in Cayman Brac is also no use as there is no where here to get these printed off. Why are the Brac contractors being disenfranchised AGAIN. Can we please have the plans provided to the Brac contractors in Cayman Brac. Is this bidding for any company that bought a table at Mac's victory dinner or just those that sat in the diamond circle? Mention should also be made that there are 200 private homes on the Bluff already, three new churches and another on the way. Many people living on the Bluff open their homes to others during storms. The new churches are large enough to take in 100s of people. The new building is difficult to justify considering the space for shelterees that already exists. "the rooms will have individual temperature control because, she said, during Hurricane Paloma some people were too hot and some were too cold"
Really?! I'm not dreaming this?! I thought shelters are supposes to save lifes and the money spent to maximise that purpose, not for adding niceties such air conditioning! O'Connor-Conolly should be ashamed of this hypocricy! At a time when we are supposedly broke (according to her & her premier) how can they justify wasting so much money on a 5 star hotel hurricane shelter? A hurricane shelter is needed yes, BUT AT THAT COST? FOOLISHNESS! VILE! Goodbye Ms. Julie, it was nice voting for you (NOT). That really is one of the stupidest things I've ever heard. The fact that it was an elected official making that comment makes it sad and pathetic. Let us not start condeming everything about this project. I never agreed with the costly material used to build this shelter. However, I do think that this shelter will prove itself a valuable asset for other things/events. And remember hurricane Ivan and how we had so many people who left Grand Cayman for higher ground. The Brac population doubled. So… I do see alot of "foresight" that was put into the planning of this shelter. It is alot better than giving funds away to churches (private faith entities) in Grand Cayman. You are about half way to understanding what needs to be done when you say "However, I do think that this shelter will prove itself a valuable asset for other things/events. " What sensible people have been saying is build a school and use it for other things, such as a hurricane shelter. But don't we have enough schools already? We are spending a fortune on one off Frank Sound Road. "When one studies history, one finds that great buildings were rarely appreciated until the person who had the vision had passed on and you read about it in the obituary." What the hell kind of history book did JuJu get that one from? I am just back from holiday and this is the kind of nauseating tripe that greets me. Damn! I hate to be the one to burst JuJu's egotistical bubble, but, it is great architecture and innovative engineering and design that, like other great art, is not always appreciated until the creator of it dies. It is almost always the designer who is eulogised to in this manner. JuJu did not design this building. Can JuJu cite just one instance where a politician affiliated with the inception of a hurricane shelter or other minor public building is thus eulogised? I would think that her place in history is already secure in that she is already immortalised as Queen of the Crappers because of all the public johns she she had built onthe Brac. JuJu "…berated critics of the project, especially the media and “the bloggers”, for not understanding her vision for the future." We can translate this as "I am the Great and Powerful JuJu; I too lofty and too pig headed and have too large an ego to stop yabbering and refrain doing stupid things and listen to the desires and aspirations that Cayman Brackers have for the future of their island. Besides, you are all too dumb to fathom my vision, so stop whining and praise me." JuJu is berating critics and the media; she has already shown her true intolerant colours in her tirade against the "Muslim" high school teacher; now she promotes her vision as the only correct one for Cayman Brac. (Is this sounding familiar, Brackers?) Are Brackers so foolish as to not realise that JuJu is acting and sounding more and more like her mentor, lord and master (Makeewa, not Jesus) every time she addresses the public? I am usually hesitant to give kudos to a politician, but in this instance Mr. Kirkconnell is 100% right. Could Brackers have voted into power a more egotistical twit than Makeewa's churchy minion? No wonder Cayman Brac is going to hell in a handbasket: too many clueless people with votes – pretty scary stuff! If voting in JuJu is the best that Cayman Brac has to offer, it is no wonder the island is turning into an impoverished wasteland. You reap what sow in life. Good going, Cayman Brac! Wow! Just Commentin, what did you consume while on vacation? Molotov's Vodka? Bhut Jolokia chilli peppers, 400 times more potent than Tobasco sauce? Your broadside, delivered through sixteen-inch verbal guns, was magnificently accurate, in spite of your shaking with righteous anger, but have you checked to see if the target was entirely blown out of the water? These politicians, you know, have protective skins that make the armour-plating of an Ankylosaurus look like used Cling-Wrap. Anyway, you might want to change your name to "Cool Hand Rebuke." Is there anyone out there that thinks this is a good idea besides JuJu. Has any polling of the Cayman Brackers taken place. seems a big waste of money on a non-revenue generating building. There is only about 1500 residents on the Brac. It would be better if Julie went door to door with the $9m and give each Bracker $6000.00 and told them to go out nd spend it in the economy. Money would circulate and we would get more bankg for the buck! This would be a win-win for the people and julie and guarantee her election next time aound….well maybe!!! If you ever get into politics, Anonymous 10:43, let us know. You will get my vote. I agree; but your math is horrible! According to the census, there are 2200 people here. Of that, I believe there are only 963 voters. Plenty of them 963 registered voters dead since the last election. And there is no way that we have 2200 people here – its more like 1700. Like the Turtle farm? At least the annual upkeep will be less. This is nothing like the turtle farm ! I've got young kids and trips to the turtle farm are awesome. While this does not speak toits financial viability, it’s nothing like the April fool’s joke that’s happening on the Brac. Is it not too late to change this building into something with a higher utilization! A school could become 'private executive hurricane shelter rooms' if that’s something every Bracker must have. The Turtle Farm subsidy leaks over CI$10mln per year (plus 8+% interest). PER YEAR. If we forget the siginificant interest, that's CI$100mln over 10 years, or CI$4,000 for every "Caymanian" (includes status grants, and paper Caymanians); expressed another way, closer to CI$10,000 for every BORN Caymanian over 10y. Subsidizing this waste to serve the very limited local appetite for meat (as there is negligible conservation being done these days) might be better accomplished in Honduras, or some other friendly third world nation where ecological selfishness is more palatable. Local consumption of turtle has long been viewed as an abomination in the eyes of ecologically sensitive residents and tourists, and makes this the poster child for the contempt people hold for illogical government sponsored projects. Exactly – a monument to Juju’s stupidity, which according to the article is something she wanted anyhow. “When one studies history, one finds that great buildings were rarely appreciated until the person who had the vision had passed on and you read about it in the obituary,” she said, adding that it did not matter if there were praises in her obituary, only that she had done as much as she could for her constituents. This says it all and why mention 'obituary' at all if it doesn't matter. One should study humility and one may learn something. Wake up Ju Ju no matter how many lifetimes you wait the people just don't want this building. Why not admit you were wrong and follow Mr. Kirkconnell's suggestion that it could be a new school? Is there any way as parents we can show our support for building a high school for our chidren, instead of wasting these millions of dollars on a building we don't need? No. Your in Cayman now not in the US or the UK. Or how about that money going towards vocational training to EDUCATE an engineer, plumber, or electrician so they can go out and make a living? Teach a man to fish……..
Our greedy self-serving politicians (ALL of them, I am not discriminating from the past decade) are FAILING THE PEOPLE when they try to placate us with grand plans and small minds. Boy oh boy, our new two-party system has learned from the worst of our Eastern Caribbean cousins how to waste money, give it to cronies, and be cXXrupt.